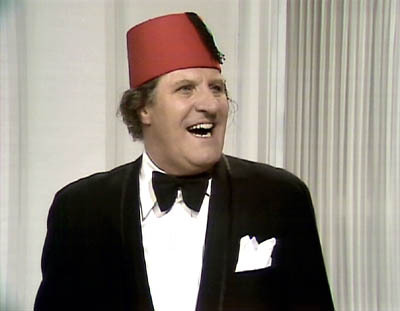 Tommy Cooper is arguably the most loved of all British comics of the twentieth century – his fame continues despite the fact that he died thirty years ago. Now a new TV biography ITV drama called Not Like That, Like This, that is set for release on Easter Monday (April 21, 2014) is to reveal that he was a violent alcoholic who kept a mistress on the side for 15 years. It was the uniqueness of Tommy Cooper’s act that made his such memorable performances. He was naturally good at making people laugh, so it is amazing to think that he never actually set out to become a comedian. He had been given a box of magic tricks as a young boy, instantly falling in love with the art and practiced intensely. At age 14, he gave his first performance but messed up so many tricks that the audience laughed hysterically. At first, he was very upset but then realised that making people laugh was something he wanted to do. He did manage to later gain admission to the Magic Circle, so he actually was a talented magician, but for the rest of his life he deliberately messed up his tricks to make people laugh. Like many talented individuals, Tommy Cooper suffered from stage fright. Once he was on the stage he was a complete pro and could easily control an audience, but he turned to alcohol as a means to overcome his stage fright. He also smoked heavily and suffered from poor health. In 1977, he suffered his first heart attack while performing a show in Rome. It was around this time that he was also diagnosed with alcoholism. He also developed bronchitis, lumbago, and sciatica. Tommy’s drinking meant that he was usually intoxicated while performing his act. This sometimes led to serious problems. He almost caused serious harm to fellow celebrity Michael Parkinson during a live TV show after convincing Michael to take part in his guillotine act. Tommy had forgotten to put the safety catch on, and it was only due to the intervention of a floor manager that disaster was averted. The fact that Tommy was unable to quit drinking and smoking meant that he was in very bad health by 1984. He died during a live TV performance for Live from Her Majesty’s. He collapsed onstage but the audience were so used to him performing crazy stunts that they assumed it was part of the act. As Tommy lay there dying, he could hear the audience laughing. It takes a lot of guts to get up on a stage and perform – even those people who have been doing it successfully for decades can still experience extreme stage fright. It is a lot of pressure, which is why so many performers turn to alcohol to help them deal with the anxiety. It can get to the stage where the person feels that they are unable to perform unless they have had plenty of drink beforehand. It is also common for individuals in this position to start to credit alcohol for their talent. This explains why somebody like Tommy Cooper may have been very reluctant to give up alcohol, despite the fact that it was having such a negative impact on his health. The reality is that many effective tools for dealing with stage fright do not involve alcohol. These days many performers use techniques like meditation or positive visualisation to help them get in the right frame of mind as well as to reduce anxiety. Perhaps if Tommy had found a different way of conquering his fears, he would have been with us for a lot longer.